Objective 1: Quantify N2O, NH3, and CO2 emissions from a continuous maize system under a combination of CC versus no CC, NT versus CT, and application of spring manure versus fall manure. Hypothesis 1: Tillage will have the greatest impact on CO2 emissions, with NT plots having the lowest emission by lessening the amount of oxygen introduced to the soil and by protecting labile organic matter in larger soil aggregates. Further, NT plots that include CC are expected to reduce all three emissions by incorporating excess C and inorganic-N into biomass. Relative to fall manure application, manure applied in the spring will decrease CO2 and N2O emissions as crop nutrient demand will be greatest, though it will increase NH3 emissions due to greater solar radiation and atmospheric temperature. Hypothesis 2: Weather events (e.g., presence or absence of precipitation, above average temperatures, strong winds at the time of manure application, etc.) will be the largest factor affecting all gas emissions and CC productivity, regardless of treatment. Objective 2: Quantify above and belowground CC biomass as well as CC N-use efficiency from NT and CT plots with application of spring manure and fall manure. Hypothesis 1: Cover crop biomass and N-content will be greatest with fall manure application as CC seeds are sewn shortly after that period, thereby providing the crop with adequate nutrients for rapid growth before soils freeze. Tillage will have less of an effect, though CT will promote greater CC biomass by loosening the soil for ease of root growth. Objective 3: Gain a rigorous understanding of the molecular mechanisms responsible for N2O fluxes before and after manure application with respect to the presence or absence of CC and the presence or absence of tillage via a viable qPCR analysis. Hypothesis 1: N2O fluxes will be greatest after manure application, regardless of treatment; however, CT plots without CCs will have the largest fluxes relative to NT plots with CCs as more residual nitrate will be available for denitrification and because labile C substrates will be liberated after tillage as a result of breaking apart soil aggregates. Hypothesis 2: N2O fluxes will be greatest after manure application, regardless of treatment; however, NT plots will favor denitrification (and thus N2O production) relative to CT plots due to the greater soil water content. Land use conversion for agriculture and traditional cultivation methods causes depletion of the original soil organic carbon (SOC) pool by 60% to 75% (Lal, 2004). Because carbon (C) storage in soils depends on a consistent source of C inputs from plants, loss of SOC with conversion can be largely attributed to a majority of crop biomass being harvested with little plant residue returned to the soil as organic matter. Adequate soil organic matter (SOM) content is essential to soil fertility and proper plant growth for two main reasons: (1) as a majority of SOM is derived from decomposed plant residues, organic matter contains all of the essential nutrients to be recycled for subsequent plant growth; (2) humus (stable organic fraction of SOM) adsorbs bioavailable nutrients for plant uptake and prevents nutrient leaching and loss (Bot and Benites, 2005). Removing plant residues thus increases the need for synthetic or organic fertilizers to replenish soil fertility for successive crops. Besides the negative effects of losing essential bioavailable nutrients, leaving soils bare during the off-season increases the risk of soil erosion and the potential for sediment bound nutrients, primarily soluble phosphorous and nitrogen (N), to leach from manure fertilizers into freshwater systems, or be lost to the atmosphere as nitrous oxide (N2O) or ammonia (NH3) via microbial or abiotic processes, respectively (Duncan et al., 2017; Terman, 1979). In all, because of the degraded soil quality from nutrient and SOC losses, crop biomass yields for subsequent harvests will be reduced, creating a feedback loop requiring increased nutrient inputs (Wightman et al., 2015). In tandem with SOC losses from conventional land management practices, the agricultural industry is the second largest GHG emitter in the United States (6.3%), next to energy (86.6%) (US EPA, 2007), and is responsible for 30% of global GHG emissions (FAO, 2012). Specifically, agriculture is responsible for approximately one-third of global net carbon dioxide (CO2) emissions primarily due to deforestation and biomass burning, but also significant fluxes being contributed to SOC mineralization and decomposition (Flach et al., 1997; Lal, 2004). Agricultural practices are also responsible for approximately 60% (~ 6 Tg N2O-N) of global anthropogenic nitrous oxide (N2O) emissions, with emissions increasing from about 270 ppb during the pre-industrial era to 319 ppb in 2005 (Snyder et al., 2009). Nitrous oxide is a potent GHG with a global warming potential 265–298 times greater than CO2 for a 100-year timescale (IPCC, 2007), has an atmospheric lifetime of 114 years (IPCC, 2001), and catalyzes stratospheric ozone depletion (Reay et al., 2012); thus, N2O largely contributes to a warming climate. Nitrous oxide emissions are especially prevalent in agricultural soils after application of N fertilizers and cropping practices (Smith et al., 2008; Signor et al., 2013).Indeed, in the United States alone, these same attributes cause approximately 78% of total N2O emissions (US EPA, 2007). Soil N2O emissions are principally a result of two microbial processes – autotrophic nitrification and heterotrophic denitrification (Fowler et al., 2013). Processes that control nitrification and denitrification are directly correlated to SOC, nitrifiable N, temperature, pH, aeration, and soil drainage (Livesley et al., 2008; Mørkved et al., 2007) – all of which are influenced by factors including crop residue, soil porosity, moisture, and aggregate stability (Robertson and Groffman, 2007). Aside from GHGs, agriculture is the primary source of ammonia (NH3) volatilization to the atmosphere, accounting for more than 50% of the global ammonia volatilization, and N fertilizer applications to crops account for the majority of this atmospheric pollutant (Gordon and Schuepp, 1994; Kaye et al., 2010; Pain and Thompson, 1988). The rate at which ammonia is lost from manure-N is largely dependent on temperature, wind, precipitation, ammoniacal N content of the manure, manure pH, manure moisture content, and the exposed manure surface area (Rotz and Oenema, 2006). Though agriculture is a major source of GHG emissions and other nutrient losses, changes in agricultural management practices such as cover cropping, no-till (NT), and appropriate timing of manure application are promising solutions for environmental degradation abatement. Cover crops (CC), a BMP used by farmers since the early 1900s, have the potential to benefit agroecosystems in numerous ways. These benefits include reduced soil erosion, increased soil fertility, increased above and belowground biodiversity, pest management, weed control (Lu et al., 2000), and increased residual manure-N uptake (Cambardella et al., 2010). Bare soils are at greatest risk of erosion as a consequence of rainfall impact and high winds. With CC, the velocity of rainfall is impeded by vegetative cover that protects the soil and results in far less soil displacement (Kaspar et al., 2001). Furthermore, CC roots give the soil a stronger foundation, much like scaffolding in a building, thereby reducing soil erosion by holding soil aggregates in place (Romkens et al., 1990). By increasing vegetative biomass, CC reduce the need for herbicide inputs by outcompeting weeds for sunlight, space, and nutrients (Kaye and Quemada, 2017). Soil fertility will be improved from the organic matter supplied after CC senescence (Duxbury et al., 1989), provided it is returned to the soil and not burnt or harvested for sale. Monoculture agriculture has led to increased pest resistance since biodiversity is greatly reduced; introducing a new vegetative species during off seasons allows for other, non-pest, organisms to compete with crop pests for existing ecological niches (Freemark and Kirk, 2001). Competition for resources such as sunlight, space, and nutrients assures that one pest population will likely never evolve to become too dominant. Lastly, of most recent interest would be the use of CC as a tool to improve manure-N efficiency by incorporating excess nutrients from the previous fertilizer application into shoot and root biomass. Cambardella et al. (2010) found that CC reduced NO3–in the surface soil compared to no CC by 32% and 67% after manure application in November 2005 and 2006, respectively. Adopting NT practice can reduce soil erosion (Oades, 1984), improve soil quality (Zinati et al., 2017), increase water retention (Copec et al., 2015), provide stable or improved crop yields (Bernstein et al. 2011), generally increase soil C gain (West and Post, 2002), and improve overall cropping system function (Snapp et al., 2005). No-till also minimizes soil disturbances which would otherwise increase the risk of erosion and introduce oxygen (O2), an electron acceptor thermodynamically favored over all other microbial respiration pathways, to the system, thereby increasing soil C loss (as CO2) through enhanced microbial decomposition (Alvarez, 2005). Additionally, adopting a NT soil management practice can directly mitigate CO2emissions compared to conventional tillage (CT) by sequestering more C in the uppermost soil layer and indirectly reduce emissions by omitting the need to use fossil fuel-based farming equipment (Alvarez, 2005; Frye, 1984). According to Socolow and Pacala (2007), expanding NT practices could prevent the release of 25 billion tons of C over the next 50 years. Aside from CO2emissions, several studies have shown increases in N2O emissions under CT systems (Koga, 2013; Mutegi et al., 2010; Plaza-Bonilla et al., 2014; Wang and Dalal, 2015), though these results prove to be variable and inconsistent at this time (Lognoul et al., 2017). No-till systems also have positive impacts on biotic soil communities, which are critical in managing nutrient cycling and thus soil fertility (Wu et al., 2015).Under a CT system, soil biodiversity is indirectly negatively altered by changes in physical and chemical properties such as SOM, soil moisture, soil temperature, and aeration – all of which control soil microbial activity (Sheibani and Ahangar, 2013).Through the decomposition of SOM, microorganisms (less than 0.1 mm in diameter) are responsible for the gradual and continuous liberation of plant nutrients via mineralization and immobilization of N, P, and sulfur (Duxbury et al., 1989). In organic soils, available nutrients that are not taken up by the plants are immobilized by soil organisms and consequently mitigate leaching (Rice, 2002). Lastly, it is known that climate is a major influence on the rate of GHG emissions by regulating soil temperature, soil moisture, and crop growth rate (Goh, 2004; Powlson et al., 2014). For these reasons, the time of year in which manure is applied can substantially impact the rate of uptake or transformation of C and N substrates (Linn and Doran, 1984). However, studies that have observed fall manure application compared to spring have typically only quantified N2O losses and show no general consensus. Duncan et al. (2017) found that applying manure in the fall as opposed to spring can significantly decrease N2O fluxes yet still provide adequate nutrients to the following CC. On the contrary, Rochette et al. (2004) found greater potential for increased N2O emissions with fall manure application. They attribute these findings to (i) addition of N when crop uptake is low; (ii) low evaporation in the fall typically results in greater soil moisture, favoring denitrification; (iii) the potential for denitrification to continue during the winter; and (iv) fall application will supply soils with N and organic C substrates which will promote denitrification after snow melt, which is consistent with the findings of Lemke et al. (1998) and Wagner-Riddle and Thurtell (1998). While agricultural BMP have their benefits, there is little information in the literature for the ideal tillage method in regard to the impacts of CC on manure-N uptake. Indeed, there may not be a BMP without tradeoffs among GHG fluxes, N volatilization, C sequestration, and soil fertility. For example, Lognoul et al. (2017) concluded that higher SOC and total N in the uppermost soil layer in a NT field of seven years contributed to increased N2O and CO2emissions compared to the CT treatment. For N2O emissions, several studies reported higher fluxes from NT compared to CT (Abdalla et al., 2013; Ball et al., 2008; D’Haene et al., 2008; Goossens et al., 2001), where other studies have shown no significant correlations between the tillage treatments (Chatskikh et al., 2008; Negassa et al., 2015). A large majority of these studies contribute the escalated emissions chiefly to increases in labile C substrates for decomposition. Of further conflict, in a review of manure application methods, Webb et al. (2010) found that incorporating manure into the soil profile directly after application decreased NH3 losses by as much as 78 to 99% in comparison to broadcast application. These findings can pose large concerns for nutrient losses as NH3in NT systems where manure will be broadcasted onto the soil surface without incorporation into the soil profile. In general, the net effects of GHG emissions and volatile N losses from NT and CT systems with different manure management methods are inconsistent and not well quantified at a global scale (Cassman et al., 2003). It is clear that there is an urgent need to develop intergraded and sustainable approaches that will improve the nutrient use efficiency of crops in order to alleviate gaseous nutrient losses from agricultural soils without compromising soil fertility. Within this framework, it is fundamental to develop the ideal tillage, off-season cropping, and manure management solutions for farms that grow corn silage in northern regions as currently more than half of the land for corn silage production is located in a zone with low temperatures from -28 to -33 °C. Furthermore, the relationship between CCs, the amount of biomass they can achieve, and the amount of manure-N that they can accumulate for the following cash crop is not understood under northern climates at this time. Similarly, there is little information amongst the literature on the interactions of tillage, manure application timing, and CC systems on GHG emissions and volatile N losses. In all, farmers that are able to successfully combine the use of NT and CC into a robust NT production system are expected to enjoy improved revenue and environmental quality for their farm and the public good. The field trial is located within Borderview Farms in Alburgh, VT (lat. 45.005, long. -73.308) and was established in Fall 2017 in a continuous corn system. Soils at this site are classified as a Benson rocky silt loam. The experimental design is a randomized complete block design with four replicates (i.e., two blocks, two replicates per block, 16 plots per block). Plot sizes are 14 feet wide by 80 feet long (4.3 by 24.4 meters), with a 40-foot (12.2 m) buffer between them. Within each block, there are eight subplot cover crop (winter rye) and manure application treatments – spring and fall CT with CC, spring and fall CT with no CC, spring and fall NT with CC, and spring and fall NT with no CC. All treatments are replicated four times (i.e., each combination of manure treatments, tillage treatments, and CC treatments are replicated four times). Liquid dairy manure will be applied in the fall or the spring at 7,000 gallons per acre. For the tilled plots, manure will be applied and incorporated the day of application. For the no-till plots, manure will remain on the soil surface. Within two days, winter rye CC will be drilled at a rate of 110 pounds of seed per acre. Within the CARE trial, I will measure GHG (N2O and CO2) and NH3 emissions from soils within all 32 plots and from two control plots which will receive no manure, CC, or tillage treatment (n = 34). GHG emissions will be collected using the static chamber method (Parkin and Venterea, 2010) with a vented PVC lid (30 cm inner diameter and 9.5 cm inner height) on the chamber collar with an air-tight elastic seal over the static flux chambers. Greenhouse gas samples will be taken from the chamber’s headspace at time 0, 15, 30, and 45 minutes to capture a linear increase in gas evolution; samples will be stored for analysis in pre-evacuated vials. GHG sampling will occur twice a month, on average, with more frequent sampling after manure application and precipitation events. GHGs will be analyzed using a GC-2014 Gas Chromatograph (Shimadzu Instruments, Kyoto, Japan) equipped with a flame ionization detector (FID), electron capture detector (ECD), and a Hayesep N 80/100 Mesh 1/8in X 1.5M stainless pre-conditioned column. Heliumis used as the carrier gas at a rate of 90 psi. Ammonia measurements will also be analyzed using static flux chambers, although with an infrared photoacoustic spectroscopy (PAS) gas analyzer (Model 1412i, Innova Air Tech Instruments, Ballerup, Denmark) for the first three sampling events within 48 hours after manure application (i.e., NH3 measurements will occur 1, 24, and 48 hours after manure application), as NH3 volatilization is the greatest within 48 hours of manure application (Dell et al., 2012; Duncan et al., 2017, Liu et al., 2018; Thompson and Meisinger, 2002). The evolution of NH3 will be recorded every minute for a duration of five minutes at each plot (36 total) by placing a vented PVC lid on the chamber collar (as above) that is connected in a closed-loop system with the PAS gas analyzer. The PAS measures gas concentrations non-destructively so any gas that is passed through the detector is returned to the chamber unaltered. As GHG fluxes from soil respiration are predominantly a microbially mediated process, it is crucial to collect data on soil physiochemical properties to gain an understanding of the soil conditions in which microbes are most productive. For this reason, soil samples will be collected no further than a meter behind the chamber base to a depth of 15 cm for each GHG sampling event at all treatments (34 soil samples per GHG sampling date). Samples will be placed in polyethylene bags, homogenized in the field, and kept on ice until transported back to the lab for further analysis. Additionally, at the time of GHG sampling, two soil temperature measurements will be recorded and averaged. Both measurements will be taken adjacent to the chamber base as to not disturb soil within the chamber. Within 24 hours of sampling, a 5 g soil subsample will be extracted with 2 M KCl for inorganic-N (NO3–and NH4+). The resulting KCl solution will be frozen for coulometric analysis on a BioTek Synergy HTX (BioTek Instruments, Inc., Winooski, Vermont, USA). Another 5 g subsample will be dried at 60 °C to constant weight to determine gravimetric soil moisture. For the first sampling event each month, the resulting dried soil will be ground to pass through a 2 mm sieve and will be placed in a muffle furnace at 550 °C for four hours to determine organic matter (OM) content. Again, for the first sampling each month, soil pH will be measured using a H+ion-selective glass electrode with 5 g of soil and 5 mL of deionized water to create a 1:1 soil slurry. Within 48 hours, for the first sampling period each month, microbial biomass C and N (MBC/N) will be analyzed by the simultaneous chloroform fumigation extraction (sCFE) method as described in Setia et al. (2012). If differences in OM content, soil pH, and/or MBC/N are not detected after three months, both analyses will not be measured again until after the next manure application. Prior to spring manure application, plots will be assessed for CC ground cover using the Canopeo application, in accordance with the protocol of Patrignani and Ochsner (2015). The cover crop height will be measured at three random locations in each plot measuring to the highest point in cm. If there is enough biomass present, the material in two quadrats (0.25 m2) in each plot will be cut to ground height, placed in a cloth bag, weighed, and dried. After drying the material, samples will be weighed again to determine dry matter content and dry matter yield per acre. The samples will be saved and ground to 1 mm in order to analyze for total N content on a Leco CHN628 (LECO Corporation, St. Joseph, Michigan, USA). The same process will be repeated directly before planting corn. The soil core method will be used to assess belowground CC biomass to a depth of 30 cm. Three samplings points will be randomly selected in plots where CC are present and a soil core with a 5 cm diameter will be used to collect CC root samples. A metallic sieve will be used to wash all soil from roots with water, which will then be air-dried to remove moisture, weighed, and dried at 65.6 °C until a constant weight is achieved. Dried samples will be reweighed and ground. Ground samples will be analyzed for total N content on a Leco CHN628. The average of the three root biomass samples will be extrapolated to the area of the plot using the dry weight of the root samples collected to the depth of the core. Nitrogen use efficiency will be expressed as a fraction and calculated as the ratio between the amount of fertilizer N removed with the CC and the amount of fertilizer N applied (Brentrup and Pallière, 2010). Termination of the CC will be done with glyphosate in the NT treatments or by tillage in the CT treatments. Collected cover crop, soil inorganic-N, and gaseous emissions data will be analyzed using an Analysis of Covariance (ANCOVA), structural equation modeling, and/or time series analysis (R Development Core Team, 2008; RStudio Team, 2015) to determine average annual and episodic significant differences between combinations of tillage, cover crops, and seasonal manure application. 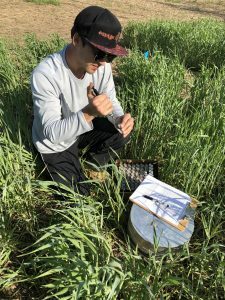 This analysis will show whether differences in gaseous losses and soil or cover crop nutrient contents are significant, and if the differences between management practices are the cause. Data analysis will begin in April 2019. In August of each year, Borderview Farm holds a ‘Crop and Soils Field Day’ where famers, service providers, students, and the general community from the northeast region come to learn about the sustainable farming practices that are being researched on the farm. The entire group is led through the farm with about 15 different talks on farming practices, machinery, alternative cropping systems, soil health, etc. I gave a talk on greenhouse gas mitigation via alternative soil management practices in August 2018, and will return in August 2019 to share new project results. Data analysis and interpretation will begin in April 2019.